The National Park Service preserves unimpaired the natural and cultural resourcees and values of the national park system for the enjoyment, education, and inspiration of this and future generations. The Park Service cooperates with partners to extend the benefits of natural and cultural resource conservation and outdoor recreation throughout this country and the world. There are serious gaps and inadequacies which must be remedied while opportunities still exist if the system is to fulfill the peoples need always to see and understand their heritage of history and the natural world. You should continue your studies to identify gaps in the system and recommend to the areas that would fill them. It is my hope that we can make a significant contribution in rounding out more of the National Park System in these next few years. From its early years, the National Park Service was cognizant that in our nation of immigrants there were stories of people who migrated to North America long before the first Englishman set foot on the eastern shores of what is now the United States. By the middle of the 20th century, the National Park Service reconsidered the notion that prehistory ended, thereby casting cultures that predate the arrival of the first European into oblivion when Europeans came to discover, explore, and establish colonial settlements in North America. The National Park Service also acknowledged that, in the process of the western expansion of the United States in the 19th century, the histories of previous colonizing powers and cultures were subsumed and forgotten. In the 21st century, the National Park Service is committed to expand the telling of our national story by examining the broader global implications of our national experience. The National Park Service initially focused on Spanish colonial history as the main vehicle to present the Latino heritage story, anchoring the story in a number of small parks across the country that emphasized exploration and missionization of native groups by Franciscan friars. While exploration and missionization were common themes of Spanish colonial history, settlement, which represented the basis of Latino heritage, was largely ignored. The first National Park Service area with a Spanish colonial theme was El Morro National Monument (proclaimed 1906), which emphasized exploration at a time in Latino history when the settlement that began in 1598 in New Mexico represented the major Spanish colonial enterprise. Similarly, Salinas Pueblo Culture National Monument (proclaimed 1909; name change 1980) focused on the missionization of pueblos but did not mention the colonial settlement from which the mission effort emanated--Santa Fe, New Mexico, which the Spanish founded in 1610. By the mid-20th century, the National Park System included three other parks related to the Latino heritage--Cabrillo National Monument (proclaimed 1913), Coronado National Memorial (authorized 1941), and De Soto National Monument (authorized 1948). These all centered on exploration and conflict between explorers and American Indian tribes in the 16th century. Still, the story of the Latino diaspora and settlement patterns of Spanish North America as a part of our national story went untold. Well into the 20th century, Spanish colonial history was misunderstood and suffered from the propaganda created in an earlier time and sustained for over four centuries. The main contributor to misconceptions was the Spanish Black Legend, which promoted the notion that Spanish colonials came to exterminate Indians and destroy cultures. Therefore, they were unworthy of any divine blessings or human acknowledgement. The Spanish Black Legend contributed to the diminished role of Latinos in our national story. 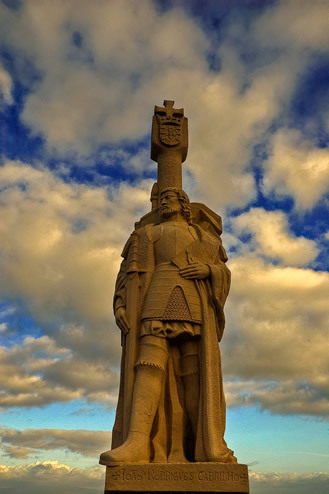 Spawned in the 16th-century Spanish-English rivalry that ended in England winning the war of propaganda, the Black Legend perpetuated negative stereotypical notions about Spain and its people who settled the Americas. Thus, the dichotomy of England as the good empire and Spain as the evil empire emerged in American lore, history, and literature. Negative beliefs about Spain prevailed and became embedded in U.S. history textbooks. Very little in textbooks revealed much about Spanish colonial enterprises, settlement, and governance other than the role of exploration and conquest in our national story. Textbooks do not mention that the Spanish established the “town meeting,” called the cabildo, as early as 1509 in Puerto Rico and other areas in the Caribbean; Mexico City in 1525; San Agustín, Florida in 1565-1570, and New Mexico in 1598-- long before the House of Burgesses in Virginia or the New England Town Meeting. The Palace of the Governors in Santa Fe, New Mexico's third capital, housed the cabildo from 1610 to the end of the Spanish Period in 1821. History books influenced a resurgence of the 16th century propaganda in negatively narrating the histories of the Battle of the Alamo (1836), the Mexican War (1846-48), and the Spanish-American War (1898). Such biases are reflected in issues dealing with immigration from Mexico or Latin America. The writing of the history of Spanish colonialism through the lens of Spanish Black Legend stereotypes has had a negative influence on how Latino heritage is viewed. Understanding the underpinnings of negative views of Latino history and heritage in the past contributes to a more positive approach and appreciation of a people who have participated in the local, regional, and national historical process of the development of North America from the earliest European migrations across the Atlantic that began over 500 years ago. Latino heritage and culture are not monolithic. Interpreting the American Latino heritage is ever more challenging when one considers that the Latino culture has many faces basically comprised of five heritages inclusive of Spanish, Indian, African, Asian, and Anglo-American. To make the American Latino heritage national story accessible, relevant, and inclusive, the interpretation of the Latino heritage at National Parks, National Historic Landmarks, National Heritage Areas, and at other historic places requires an understanding of what the Latino identity and experience are in the diverse ethnic and geographical sections of the United States. In 1992, the commemoration of the 500th anniversary of Christopher Columbus' first voyage evoked both negative and positive responses. The National Park Service responded positively by preparing for the event and creating the Spanish Colonial Research Center at the University of New Mexico campus in Albuquerque, New Mexico, to conduct research in international archives; develop a database of archival materials; produce publications; establish Spanish-language translation services for National Parks, sister agencies, and local entities; and carry out training courses for interpreters and public events. Translations have made National Parks more welcoming and accessible and encouraged the visitor to learn about the American heritage in all of its dimensions. During the 1990s, the Spanish Colonial Research Center nurtured an Hispanic consciousness within the National Park Service. National Parks associated with Spanish colonial themes became more relevant, fair, inclusive, and accessible through the narration of the Spanish colonial legacy as part of our national experience. That legacy must be expanded to include the rest of the Latino heritage in American history. Of nearly 400 National Parks, 194 have a direct or indirect association with the American Latino heritage experience. At least four National Historic Trails tell the story of Latino settlement along historic routes between Texas and California: the Camino Real de Tierra Adentro (Royal Road of the Interior), Camino Real de los Tejas (Texas), Old Spanish Trail, and the Anza Trail. Many National Parks, National Historic Trails, National Heritage Areas, and National Historic Landmarks carry or potentially could interpret Latino heritage themes. In addition, historic sites in communities throughout the nation illustrate the important role of Latino people in the American story. Some of them already are in our National Register of Historic Places, which the National Park Service expands and maintains for the nation. Many more are worthy of recognition. Visitors to these historic places can experience Latino heritage as a part of our national story running from the Spanish colonial period, through 19th- and 20th-century events to the present. In between the Texas-Mexican border stands a memorial where the American and Mexican flags fly together as a symbol of the historic treaty that ended a century-long dispute between the United States and Mexico. The Chamizal National Memorial commemorates the milestone in both nations' diplomatic relations and its influence over the United States' and Mexico’s shared heritage and border culture. 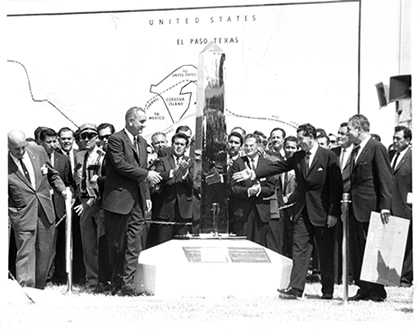 President Lyndon B. Johnson and President Adolfo Lopez Mateos of Mexico at the 1964 unveiling of the new boundary marker. Today, the National Park Service is exploring the American Latino heritage experience in both the 19th and 20th centuries that represents the broad participation and contributions of Latinos in our national story. National Parks that deal with the Spanish colonial period outnumber those that illustrate any other period of the history of the Latino heritage and experience and too few historic sites that illustrate the breadth of Latino heritage are designated as National Historic Landmarks or listed in the National Register. In order to expand the commemoration of the Latino experience as an integral part of our national story, the National Park Service has developed a special American Latino Heritage Theme Study to enhance current approaches taken to tell about the Latino experience in America. The theme study also serves as a plan to sustain new topics related to the nation’s Latino heritage and assists and encourages the identification, recognition, and understanding of historic places that tell the breadth of the Latino heritage story. The American Latino Theme Study encourages the NPS and other agencies to define a balanced and complete representation of the nation's Latino heritage. Written by a team of noted scholars, the Latino Theme Study serves as an aid to identify "gaps" that presently exist in the units of the National Park System and in the designation of National Historic Landmarks related to Latino heritage. The theme study also helps interested people in identifying other historic places that are worthy of National Register listing in communities throughout the nation. In the long run, areas associated with Latino heritage themes that are presently outside the National Park Service could potentially be added to the National Park Service System, be designated National Historic Landmarks, and be listed in the National Register. To that end, the National Park Service encourages the public to assist in identifying historic places associated with the American Latino heritage that may be eligible for the National Register or for designation as National Historic Landmarks. The history of the Latino heritage began with the European discovery of the New World by Christopher Columbus, which introduced European cultural traditions including language, law, governance, religion, lore, science, technology, and a literary tradition to the Americas based on values developed throughout the history of western civilization. Beginning with Columbus' journals and correspondence concerning his four voyages, a written tradition quickly grew in the Americas. Literally millions of pages of documents; maps; and artistic sketches of flora, fauna, and Native Americans of North America can be found in the archives and depositories of Spain, Mexico, the Caribbean, and the United States. From Columbus' first voyage to the end of the colonial period, Spanish place names dotted colonial maps of the Western Hemisphere. As towns were established, roads, walls, bridges, and buildings were among the many structures built in the New World. The Spanish Empire extended from Alaska to the Strait of Magellan and from North Africa across the Americas to the Philippines. In North America, particularly the area of present-day United States, the Spanish colonial heritage dates to the earliest exploration of the Atlantic seaboard. The development of the historical patrimony of North America paralleled the successive national expansions by Spain, England, France, and the United States. Spain's pioneering frontier movement in North America grew out of the conquest of Cuba and the islands in the Caribbean in the east and Mexico on the mainland. The list of States in the United States with Hispanic cultural and historical influence is impressive. The Spanish Empire significantly touched a vast area stretching along the California coast past Oregon, Washington, and Alaska. In the interior Nevada, Utah, Colorado, Oklahoma, Kansas, Nebraska, Missouri, and Louisiana formed a large trade network centered in the Spanish settlements of Arizona, New Mexico, and Texas. Spanish occupation of the Louisiana-Florida frontier influenced trade along the Mississippi River from New Orleans to Arkansas Post and St. Louis. Virginia and the Carolinas are not without their Hispanic past, for explorers and missionaries were among the first Europeans to touch their shores. Similarly, far from the continental United States, the Virgin Islands, Puerto Rico, Hawaii, and Guam share varying degrees of the same Hispanic heritage. In many cases, history, ethnic composition, place names, linguistics, and cultural manifestations are a part of the Latino legacy that Spanish colonialism in North America spawned. Because of Spanish colonialism, the United States shares a common heritage with the rest of the Western Hemisphere.